Sir Henry Neville, the courtier and diplomatist, was born in 1564 and grew up at Billingbear House in Berkshire, which his father, Sir Henry Neville Senior, had built when he was three. His mother was Elizabeth daughter of John Gresham MP of Mayfield in East Sussex and Northend at Fulham in Middlesex . Henry matriculated at Merton College, Oxford, on 20th December 1577 and, on 30th August 1605, was created a Master of Arts. During his young adulthood, Neville lived at the old Archbishop's Palace at Mayfield, inherited by his parents from his mother's cousin, the famous financier and founder of the Royal Exchange, Sir Thomas Gresham (who had bought it from Henry's maternal grandfather). There, he carried on the business of an iron-founder at the famous Mayfield Furnace. He was introduced at Court by William Cecil, Lord Burghley, whose wife's niece he married in December 1584. Throughout his life, Henry sat in parliament, being the member for New Windsor (where his father was influential) in 1584-5 and 1593, Sussex in 1588-9 (where he lived), Liskeard (where his brother-in-law was Steward) in 1597-8, Kent in 1601, Lewes in 1603-4 and Berkshire in 1604-11 and 1614 (where he then lived). In 1592, he managed to obtain a five-year monopoly for the export of cast iron cannon from England: thus producing more guns than anyone else in the country. The following year, Neville's father's died and he succeeded to the family estates but, when his trading monopoly ended, he sold Mayfield in order to consolidate his position in Berkshire, closer to the Royal Court. He had already been put in charge of Royal lands in that county in 1593, as Steward of Donnington Castle and the old Bishop's Palace at Sonning (where his coat of arms is remembered at the Bull Inn) and Bailiff of lands in Newbury; and had been appointed Sheriff in 1595 and Deputy-Lieutenant the following year. As a man of high character, Neville was soon selected for important Royal service. In 1599, he was knighted and sent as Ambassador to France, though he was somewhat reluctant to take up the post as it could incur huge personal expense. 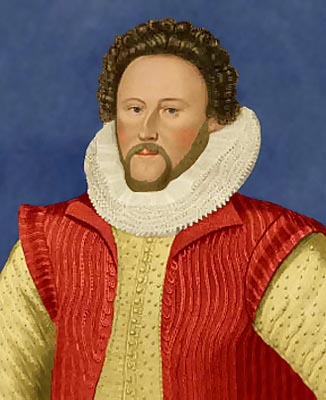 Neville claimed he needed to be in England to arrange payment for the estates of the deceased Sir Henry Unton (centred on Wadley House at Littleworth in Faringdon). His excuses were rejected and he was sent to Paris anyway. His short embassy was dominated by complaints about French attacks on English ships and the debts owed to England as a result of help given during the Wars of the Catholic League. He also entered into negotiations with the Spanish over peace in the Netherlands at Boulogne, but he had already had a dispute with the Spanish ambassador over precedency and the talks soon broke down. The declining influence of Protestants at the French court worried Neville considerably and he complained that he was not overly well treated there. So, when troubled by deafness in February 1600, he asked to be recalled. He, afterwards, complained that he had spent some £4,000 of his own money while in France. Sir Henry returned to England in time to become embroiled in Essex's Plot against the Government. Although he was not part of the Earl's inner circle, he had certainly had meetings with him, sympathised with his more Protestant stance and knew of the designs of his followers, having been in the confidence of the Earl of Southampton. Consequently, when the rebellion failed, Neville suddenly became very keen to take up his ambassadorial post again, but he was arrested aboard his ship at Dover and imprisoned, briefly in Chelsea and then in the Tower of London. He was brought before the Royal Council on 8th July, dismissed from his position and fined £5,000. In the last year of Queen Elizabeth's reign, he agreed to pay that sum in yearly installments of £1,000. Upon James I's accession, he was released by Royal Warrant on 10th April 1603. There is an allusion to his dangerous situation in one of Ben Jonson's Epigrams. Under James I, Sir Henrye played a more prominent role in politics. He inclined to the popular party. While in Paris, he had been called a puritan. His advice was at all events not to James's taste. In the first session of 1610, he advised the King to give way to the demands of the House of Commons. With a family of marriageable age and desperate for money, Neville became much interested in commercial affairs as well as ingratiating himself with the monarch. In 1613, he even drew up a scheme for an overland trade route from India. The previous year, he had urged the calling of a parliament and drew up a paper on the subject, in which he recommended a concessionary compromise with Parliament over the Royal prerogative since supplies would be easily voted for if grievances were redressed. He hoped this would find favour with the King. On Salisbury's death, later the same year, Neville was a candidate for the Secretaryship of State. He persuaded the King's favourite, Robert Carr, Viscount Rochester, to arrange a meeting for him with his Royal master in Windsor Great Park, where he outlined his plans. His appointment would have been popular, but the King had no liking for him or for the policy which can only have regarded complete surrender. Southampton used his influence on Neville's behalf but, by October 1613, his chances were hopeless. Ralph Winwood, who had been his clerk in Paris, was made Secretary in 1614, much to Neville's irritation, and he refused Rochester's offer of the office of Treasurer of the Chamber as a compensation. In the 'Addled Parliament' of 1614, the paper of advice which Neville had shown the King in the Great Park was discussed by the Commons in the May and, with his view, the Commons could find no fault. potentially profitable patent to prosecute those despoiling royal forest, on which he had set his store, denied him by the council. He died on 10th July 1615, when his eldest son, Henry, inherited Billingbear. His widow retired to Shellingford Manor. He married Anne, daughter of the diplomat, Sir Henry Killigrew and Katherine, daughter of King Edward VI's tutor, Sir Anthony Cooke of Gidea Hall at Romford in Essex. As well as being the sister-in-law to Lord Burghley, her mother was also sister-in-law of the Lord Chancellor, Sir Nicholas Bacon, who was the father (by his first marriage) of Henry's step-mother; and also the sister of Elizabeth, Lady Hoby & Lady Russell from Bisham 'Abbey'. Sir Henry and Lady Neville had five sons and six daughters. Of the sons, Sir Henry (1588-1629) of Billingbear was father of Henry Neville (1620-1694), the political writer; William (1596-1640), the second son, was Fellow of Merton College, Oxford; Edward (1601-1632), a Fellow of King's College, Cambridge; Charles (1607-1626); and Richard (1608-1644) was Sub-Warden of Merton and ancestor, in the female line, of the Nevilles, Barons of Braybrooke. Of the daughters, Frances (1592-1660) married, firstly, Sir Richard Worseley of Appledurcombe in Hampshire, and, secondly, Major-General Jerome Brett of Rotherby in Leicestershire; Catherine (died 1650) married Sir Richard Brooks of Norton in Cheshire; Dorothy (1605-1673) married Richard Catlyn of Wingfield Castle in Suffolk; Anne (born 1610) married Thomas Vicars (1589–1638), the theologian; Elizabeth (1610-1657) married, firstly, William Glover, secondly, Sir Henry Berkeley of Yarlington in Somerset, and, thirdly, Thomas Duke; and Mary (1613-1642) married Sir Edward Lewknor of Denham Hall, Suffolk. It has recently been suggested that Neville was the 'true' author of Shakespeare's plays, but this idea has found little support in academic circles.